Our long-distance WiFi network has made huge improvements in connectivity for NetHope member organizations. Some had no connectivity before. Others had limited connectivity, like a 160 kbit connection that jumped to 1.6 Mbit. That’s like going from 3 dialup connections to a cable or DSL connection. These leaps in access have immediate impact when 20-100 people are sharing bandwidth at each location. International staff are able to make high-quality Skype video calls when before even voice calls were next to impossible, cutting resupply and rebuilding times by weeks or months. We want to do more than just build out physical infrastructure; we also want to build the human capacity of local Haitian companies. Eventually, we hope they can deploy these technologies themselves, expanding the benefits of ICT beyond Inveneo’s direct reach. WiFi, like most radio technologies, works on the principle of line-of-sight – you have to see it to beam to it. So the very first step in building a long-distance wireless network is to make sure your nodes are visible to each other. We usually achieve this by conducting a site visit – we or an Inveneo Certified ICT Partner physically visits each site that will host a node and captures its GPS coordinates. In Port-au-Prince, where transportation is difficult, we try to get as much information in advance as possible, starting with GPS locations. This isn’t always easy. Many agencies don’t have GPS devices, and those that do don’t always use them correctly. We’ve been given coordinates that are miles off the actual location, a real issue when street signs are missing, landmarks are destroyed and the city has a dusk curfew. This is where OpenStreetMap is a godsend – volunteers are mapping locations with great accuracy and posting them online, which we can use in our planning (read more here). Once we have the locations, we use Radio Mobile and Google Earth to design the network. Both use terrain data from the Space Shuttle to model the surface of the earth. With these tools, we find the correct angles, both azimuth (side to side) and elevation (up and down) that each antenna will need to achieve the highest gain (signal strength) between nodes. Now that we know where to place each node location, we try to make sure the site can support the required equipment: we confirm the site is physically secure, the building structurally sound, that there is a physical location for the equipment and constant, clean electrical power, that we can get roof access and that we can work with the organization’s IT staff as needed. These might seem frivolous questions unless you’ve arrived at an African school after a several hour overland drive to find the headmaster expecting you to install computers in an empty room that doesn’t have desks, doors or window panes. In Haiti, we added the roof access question after Andris found himself climbing a rickety, bent ladder, with the real threat of a fall that might have sent him to already overburdened local medical facilities. From the design plan made up of the node locations, we first set up an antenna from our live network pointing in the direction of the new node. In Haiti, a Garmin GPSMAP 76CSx is our location notepad – giving a good indication of direction, automatically compensating for magnetic declination (9.5 degrees in Haiti), and producing a compass bearing for use in the actual azimuth aiming of the dish. For elevation, usually less than 8 degrees or so, we use a bubble level to get the dish positioned properly and then (very technically) “bump” the dish to ensure accuracy. Again, this dish is beaming WiFi into the wild at this point, without a receiving antenna set up (yet). So the next step is to install an antenna at the other end of the link, at the site that needs connectivity. As any good engineer will tell you, detailed preparation makes all the difference in a deployment. So the night before we visit a hub location to install a node we make a complete packing list for each day’s loadout.. This includes the number of antennas, radios, switches, VOIP ATAs, etc. Each piece of gear goes in a large Ziplock with all the other parts it takes to make it work – switches get packed with their power adapters, ATAs, phones, and patch cables go together and WiFi radio antennas get packed with their Power Over Ethernet (PoE) injectors along with the antenna mount bracket. All this gear travels in extremely durable Pelican cases. We always take one large Pelican case that serves as a toolkit, large first aid kit, and consumable supply depot for equipment like electrical tape, duct tape, cable ties, and RJ45 connectors. Once on site, antenna setup goes fastest with at least two people – one as antenna jockey on the roof, the other as networking guru patching into the existing network or making one on the fly. In Haiti, it has tended to be Andris on the roof and Mark in the server room. After Andris has climbed onto the roof, he hoists up the antenna equipment, and quickly reels off CAT5e cable for Mark. Running the cable from the roof to the server room (or WiFi hotspot location) is done first because it is one of the most time-consuming aspects of the implementation. Now Andris sets up his antenna mount – we’re using speaker stands weighted with rubble and sandbags, and attaches a Ubiquiti Rocket M5 antenna and Rocket Dish for long links or a BulletM5 antenna and 25dBi grid dish for short-to-medium links. Both of these antennas are point-to-point, transmitting 802.11n in the 5 GHz band, which is less cluttered than the 2.4 GHz band, regularly full of standard 802.11b/g WiFi traffic. And when we are patient with the aiming tools (GPS, compass, and level), the antennas can be aligned before we even need to use the radio software to align them. When finished, we usually see a -65 dBm signal level with each link. While Andris is on the roof, Mark runs the CAT5e cable into the building and attaches it to the PoE injectors. PoE injectors send power over the 4 unused wires in the ethernet cables, so we can energize the Ubiquiti antennas without running a second cable. He then connects to the existing network through a Cisco switch. When there isn’t an existing network, we use either the Ubiquiti Nano2 or the Ubiquiti Pico2 as a local access point. This is often the case in Port-au-Prince, where the existing infrastructure is often unusable, usually because the building is damaged or unsafe. Then a Nano2 provides great directional wireless access, say for an outdoor office and a Pico2 gives good indoor omni-directional coverage. Putting up the network infrastructure might be hard, but managing the network once it is up is equally challenging. Each computer at every location requires its own unique IP address, and every computer wants to communicate with remote servers outside of Haiti at the same time. Yet there is only so much bandwidth at any one node and at the uplink point. 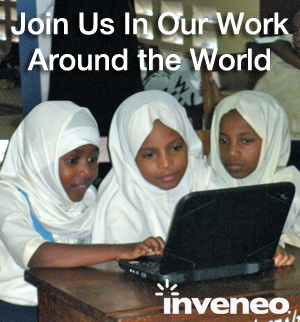 With eleven nodes and counting, we’re very lucky that the OpenNMS community, developers of the first enterprise grade network management platform, have taken on Inveneo’s network in Haiti to help us manage user needs. OpenNMS Group has even given us a free commercial support account. Using OpenNMS, we’ve been able to monitor network usage and then use other tools for traffic shaping, making sure that each user, at each node, has equal amount of bandwidth for his or her communication needs. If you’ve read this far, you will probably be interested in our long-distance WiFI solutions and how we and our Certified ICT Partners can bring Internet access to rural and underserved communities in the developing world. You can learn more by following us in real-time via RSS, Twitter, or Facebook. And if you’re interested in working with us, please complete our client inquiry form.